However chaotic life gets during the week, I do LOVE a Sunday roast. There’s something about the ritual of sitting down together and eating a roast dinner, that never fails to warm my cockles. Topside beef is a great value joint to buy, cooking it like this makes it very tender. This ‘roast’ takes hardly any prep and bubbles away whilst I get on with something else. It magically creates YUMMY gravy as it cooks. One less job to do! 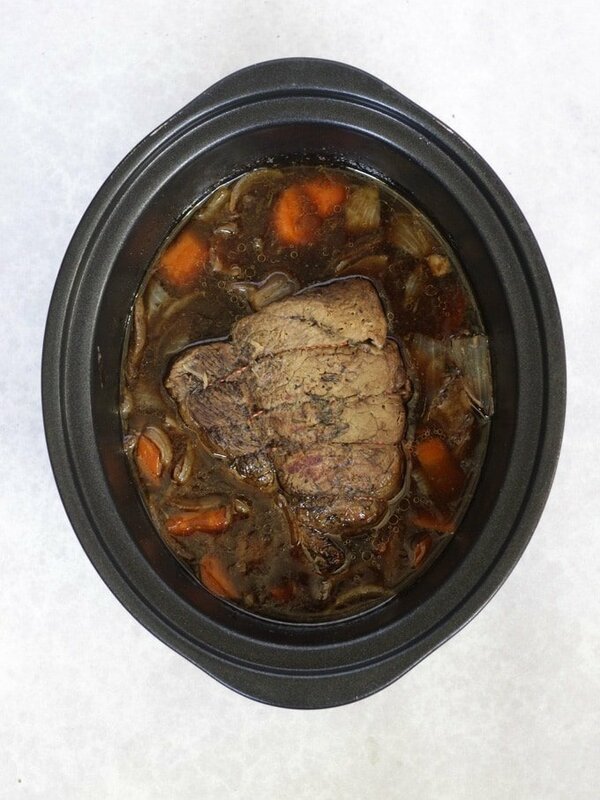 HOW DO YOU COOK BEEF IN A SLOW COOKER? 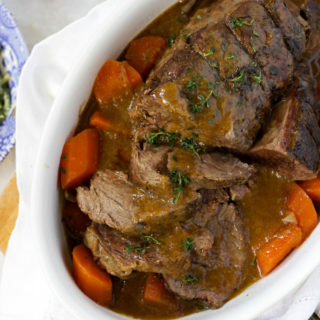 To make this easy Slow Cooker Beef Joint recipe, sprinkle flour, thyme, garlic powder and salt and pepper on to a chopping board. Dry your topside of beef well with kitchen roll and turn it over the flour mixture until it is well coated. Now, heat the oil in a frying pan and brown the joint of beef all over ensuring, each side is coloured. This seals flavour into the meat. Remove the meat from the pan and add: garlic, onions, and carrots and cook for five minutes until they begin to soften. Now, put the meat and vegetables into the slow cooker pan. Finally, pour over a can of beef consommé, and add in a beef stock pot (or crumble a stock cube in). I used a tin of Beef consommé in this recipe. (Consommé is basically a clear stock/broth/soup.) It is a perfect cheat for making sauce or gravy for beef based dishes. It gives you a rich dark gravy, and as it is tinned can last in the cupboard for ages meaning its always handy. Cook on HIGH for 5 hours, or LOW for 7. 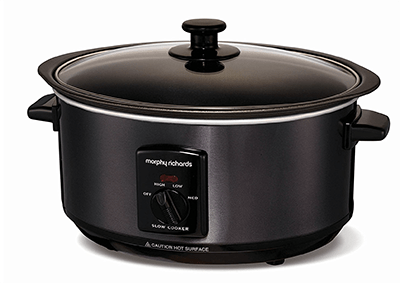 I haven’t tried heaps of slow cookers, but I LOVE this one as I can use just one pan to quickly sear and cook. The pan is also super light which I love. 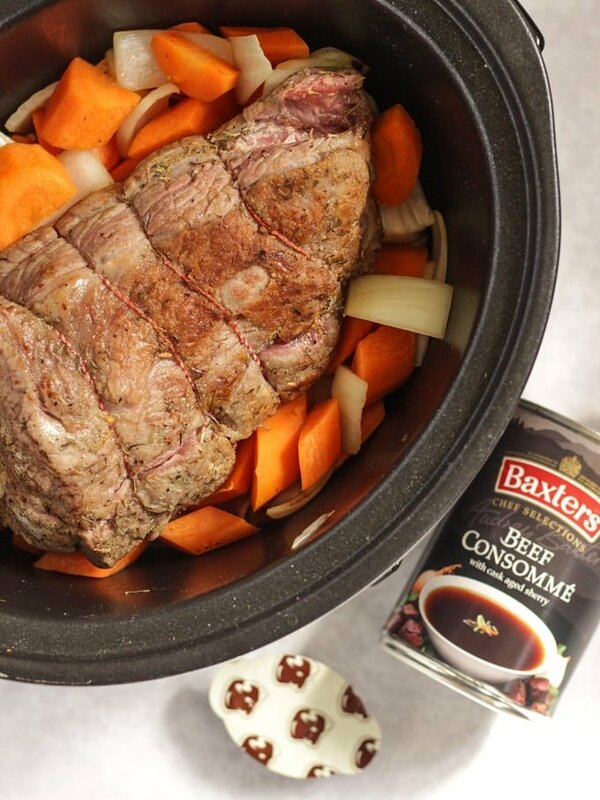 HOW DO YOU MAKE SLOW COOKER ROAST BEEF GRAVY? 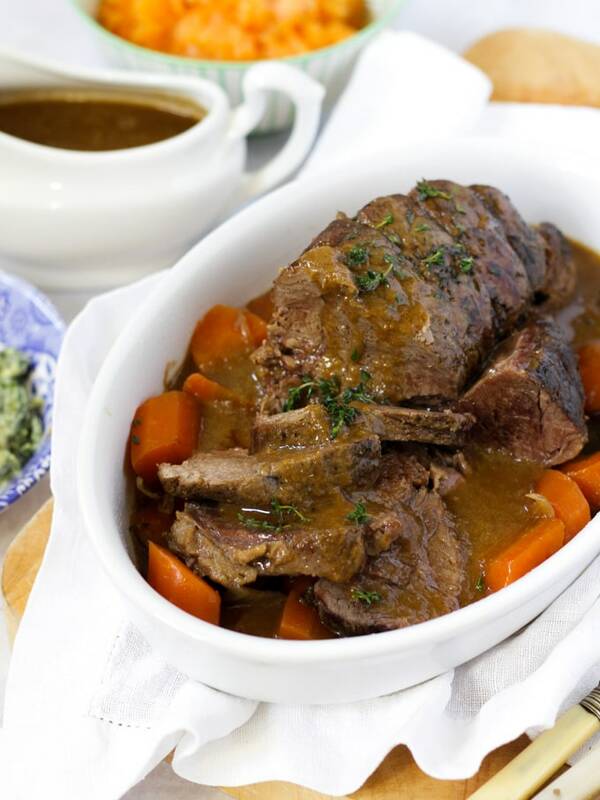 This slow cooker roast beef gravy is so easy. 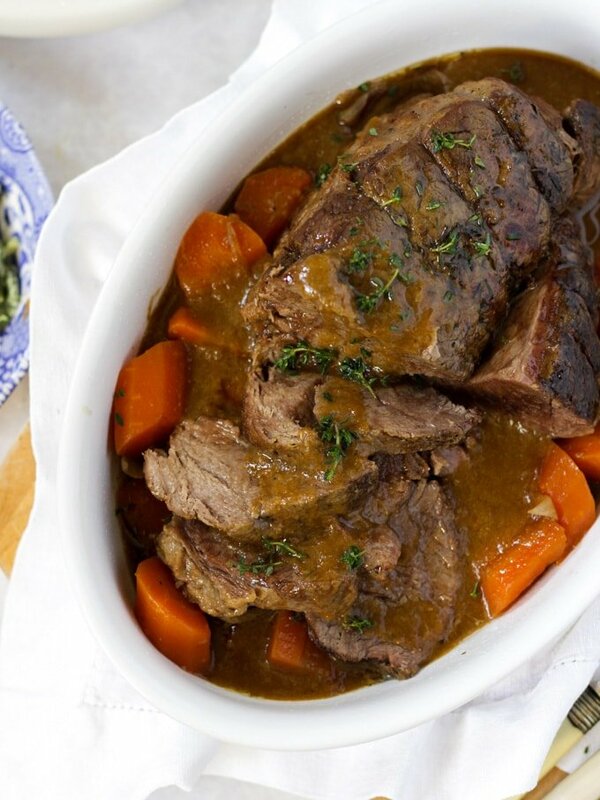 Remove the beef and as many whole carrots as you can from the slow cooker. 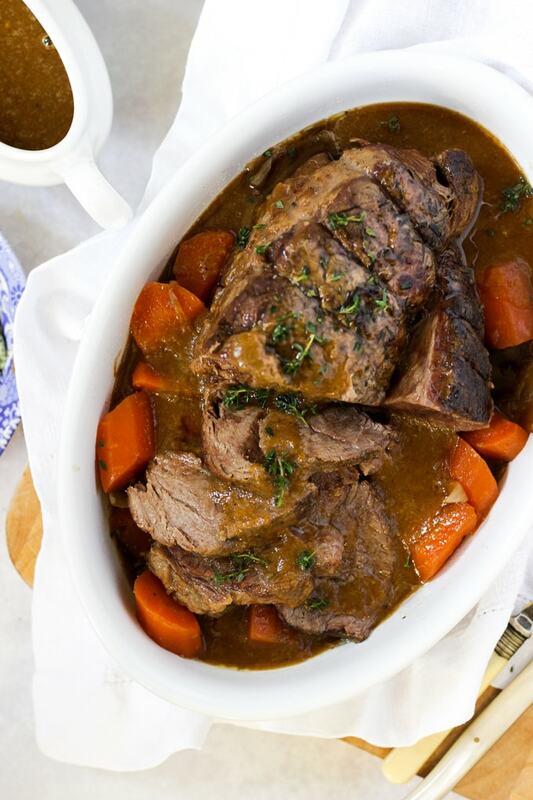 Now take a stick blender and blend the rest of the ingredients to make a thick and delicious gravy to pour over your Slow Cooker Beef Joint. Often if I do a midweek roast, I won’t do all the trimmings just some simply cooked vegetables and mash or sautéed potatoes – all of the comfort, less of the hassle. Leftover slow cooker beef makes the best sandwiches. For maximum taste reheat the meat in your left over gravy and this keeps it moist. (It should stay fresh kept in the fridge for up to 3 days). Serve in sliced bread or bread rolls. 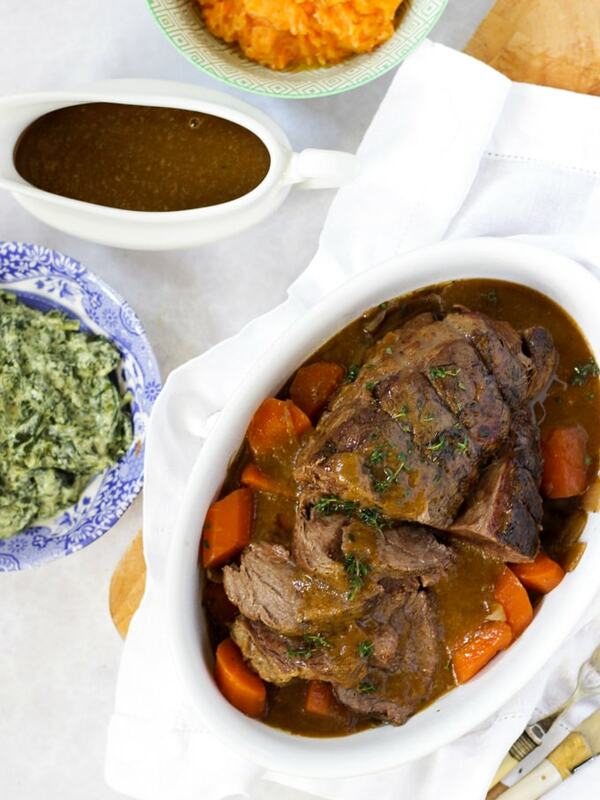 I often serve leftovers of this with Orzo pasta, super quick to cook and soaks up the gravy beautifully. 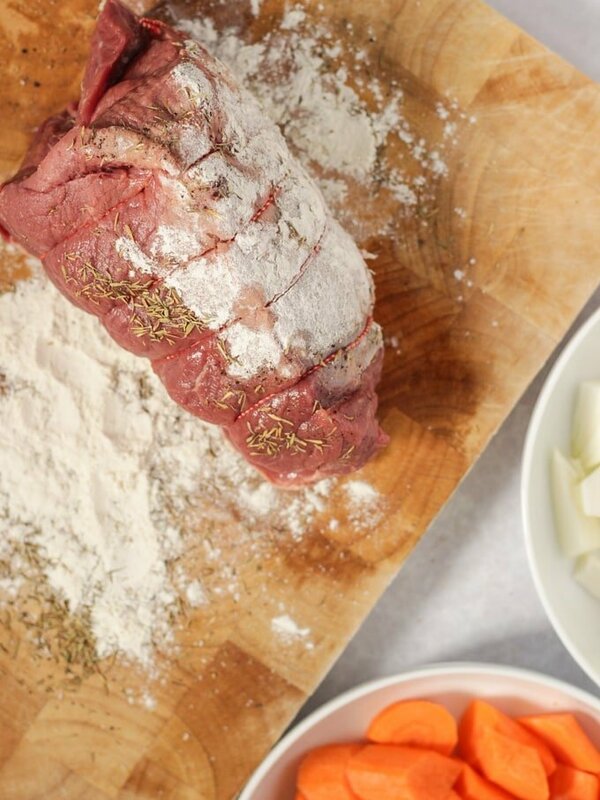 Make sure that you dry the topside of beef as much as possible before rolling in the flour mixture. A drier piece of meat will brown better, and more quickly. Often recipes say there is no need to brown your beef but when browning meat something called the Maillard reaction takes place and it does add depth of flavour. However, it really isn’t the end of the world if you don’t have time to do this step, you will still end up with a tasty roast. If your gravy isn’t as thick as you would like, remove a small amount of the liquid from the pan and stir in some cornflour until it dissolves. Add a small amount at first and stir in, keep adding until you get a thick paste. Then add this back into the pan and stir. Also, you can add some carrots back into he liquid as once blended these will add thickness to your gravy. To make this recipe gluten free, simply substitute the plain flour for a gluten free version, like cornflour. You will have lots of gravy so you can freeze any leftovers. FREEZER SPACE SAVING TIP: Pour the gravy into freezer bags and freeze it flat! I hope you enjoy this recipe as much as we do. 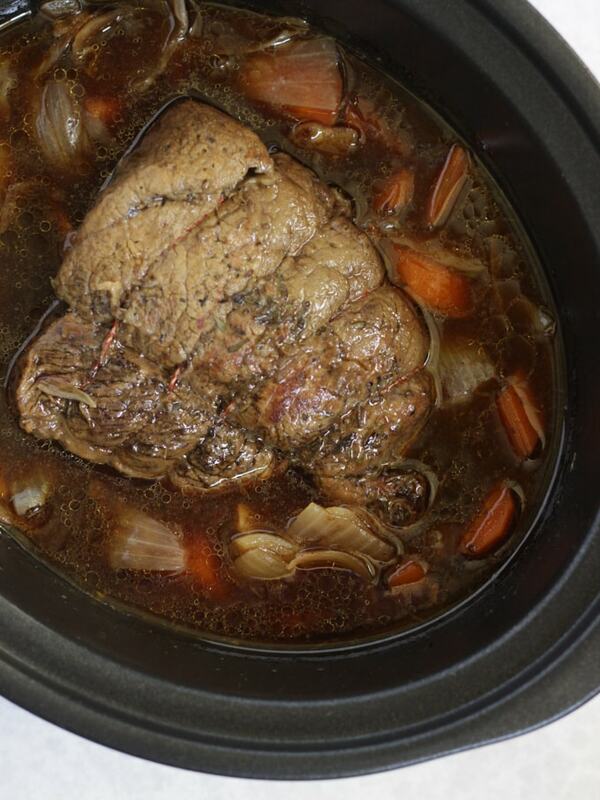 I’d love to know how you got on and what you thought of it if you make this Slow Cooker Beef Joint recipe. Please rate the recipe and leave me a comment below if you do. Sprinkle your flour, thyme, garlic powder and salt and pepper onto a chopping board. Dry off your topside with some kitchen paper and then roll all over in the flour mixture. 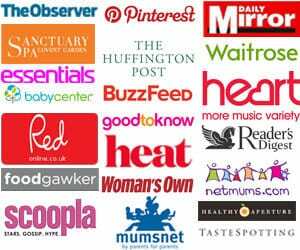 Heat your oil in a large frying pan, or if your slow cooker allows it, by putting the cooking dish onto the hob. Brown off the flour coated meat on all sides. Remove the meat from the pan and add the garlic, onions and carrots and brown for 5 minutes until starting to soften. If you're using your slow cooker pan, add the meat back in. If you're using a frying pan, transfer everything to your slow cooker pan. Pour in the tin of beef consommé and add a beef stock pot. Cook on HIGH for 5 hours or LOW for 7 hours. When cooked, remove the meat to a pan, along with some of the whole cooked carrots (as many as you can fish out!). Blend the rest of the liquid, onions and garlic to make a thick and delicious gravy to pour over. Yes, I should think so, just make sure you cook it long and slow!